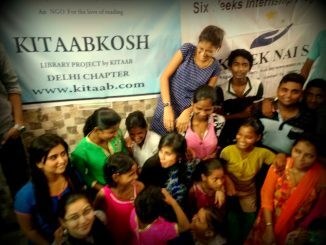 Kitaab Club Winter Internship – Herwal Primary. To teach children relation between alphabet symbols and pronunciation. To build their confidence to speak up. To teach basic lessons like colour differences every 5-6 year old should know. Story telling by children in groups from picture books. Introduction to English alphabets Because of their inability to write the alphabets after initial few trials wherein they were asked to copy from the board, photocopies of fill in the blank to form the letter were used. Taught action songs in order to keep their attention in the classroom in definite intervals. Introduced Colour chart and taught distinctions between colours based on objects they daily encounter. Conducted an activity based on sketching a scenery with mountains, sun, river and a house. Then they were asked to come one by one pick any colour (used a box of crayons) that they felt would be apt for the objects in the picture. For example- One student picked green for the mountains. Towards last two days they able to differentiate primary colours by identifying Blue with Sky, Green with Leaves, Black with Hair, Yellow with Sun, Pink with Flowers etc. Video was shown in addition to demonstration via a kit prepared having basic amenities like Tooth brush, soap, oil, etc. The children appeared the next 3 days dabbed in oil which was a great sight that they were at least trying as their dry skin give way to cracks and bleeding otherwise. Every single child had a handkerchief on the last day mainly due to incentive structure. Importance of being grateful to their parents and teachers and non-teaching staff in addition to saying Thank You/ Dhanyavaad upon receiving a gift. Students who said followed the lessons were given balloons or stickers. Around 7-8 children are below age 4, which makes it difficult for them to understand and comprehend any instruction. Cannot retain pronunciations for long in the memory due to the vernacular influence. Differentiation of colours is mixed and confused even after drawing parallels to objects of daily use. Since the previous report reflected that children had low confidence, interns were required to adopt a hands on approach to work on interaction and confidence building techniques. Previous report also reflected that children were practicing rote learning and copying each other, therefore the agenda for this workshop was to enhance individual creative thought. Over the course of eight days picture books were regularly distributed and children were asked to make their own stories based on the illustrations. Books such as “The Fox and the Stork” and “The Mouse and The Lion” were used. This was a game that was played with the kids. It aimed to work on their concentration and recalling ability. It was earlier noticed that the children got easily distracted. In this game the children had to do actions (predetermined) which were opposite to the gestures that the intern was doing. Basic two letter words were dictated. Prepared a scene from the book Chacha Chowdhury and the Football World Cup (excerpts) and asked the children to play certain characters. They enacted the scene quite remarkably. Although they were quite hesitant in the beginning but gradually the shyness just wore off. 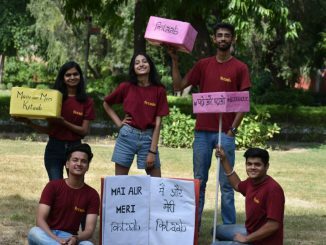 Through songs like “Dil hai chota sa chothi si aasha” and “Itni si hassi itni si khushi”, interns aimed at working on their pronunciation. 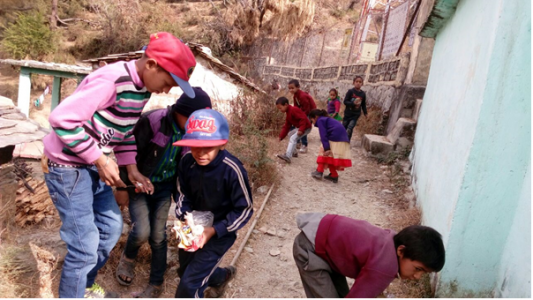 During the first few days it was noticed that children lacked hygiene and would have running noses. Thus to combat this an animated video on hygiene was used to inculcate a sense on hygiene in the children. Towards day 5 and y6 there was a visible difference and children began carrying handkerchiefs to school. Conducted an activity based on sketching a scenery with mountains, sun, river and a house. Then they were asked to come one by one pick any colour (used a box of crayons) that they felt would be apt for the objects in the picture. For example- One student picked green for the mountains. On being asked why the student said that to him they were green because of the trees. Asked them to clean their school, kept a dustbin and asked them to throw their stuff there and not hither and thither. Kept a soap and showed them how to wash their hands properly. Informed children about diseases and their spread therefore reinforcing the need to wash hands. Children lack basic hygiene and rely heavily on rote learning. They memorize things and therefore skills like logic and reasoning are extremely low in these children. They are unable to identify alphabets if they are not shown in order. Their pronunciation of “sh” and “s” influences their writing skills. They are unable to understand the flow and sequence of stories. They are intimidated by their teachers and do not ask questions. Objective – Confidence building and creative ability enhancement. Improvement in spellings and expansion of vocabulary. Map reading, clock reading and basic concept of planets, solar systems etc. Methods of story reading, interactive activities and games, poems with suitable morals and dictations were taken. 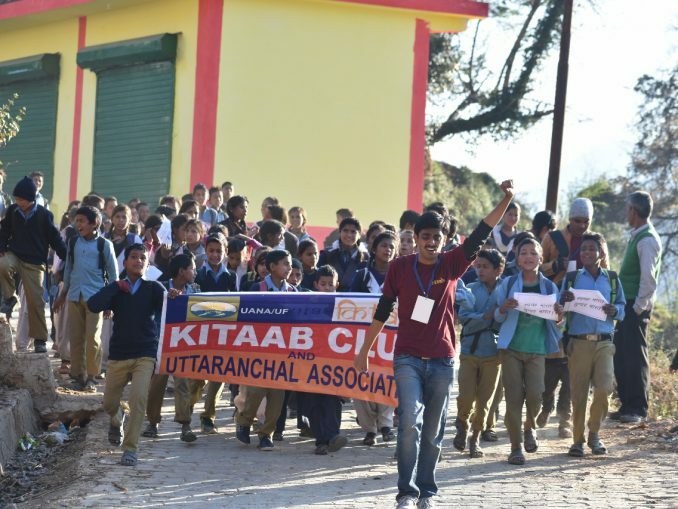 A cleanliness drive was organized for the elder students. They were shown the animated video on hygiene that was used by all interns. 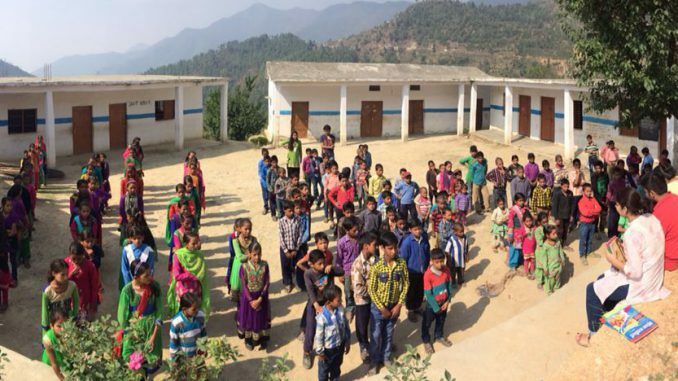 They were taught the importance of keeping their school and themselves clean. They were shown basic hygiene kit which consists of toothbrush, paste, tongue -cleaner, soap, hair oil, face and body cream. A dustbin was installed in the school. Children were unable to tell the time or understand how to even read a clock. Students were made to draw clocks and were then told how to read them. They even acted out how a clocks hands move. Students of class 4 and 5 were unable to logically construct a story through the use of picture books hence “Panchatantra” was used. They read stories daily and discussed what they had learnt from those stories. Children didn’t know the names of colours and identified with them through objects. They were told the names of the colours and were given crayons to draw pictures of animals and birds. While the children were aware of the fact 29 states, they were unable to identify them. Therefore they were shown the map and told interesting facts about each state. The story reading sessions exposed the children to new words. They were made to write them down along with their meanings. A dictation was also taken to improve the children’s writing skills. Rote learning and lack of logic is a big problem. Students were unable to recognize colours and name them. Students considered Sri Lanka, Bangladesh and Myanmar as a part of India before the map session. Students were unable to tell the time. Objective – According to the previous report many children did not know the proper pronunciation of alphabets or their identification in this age group. Therefore this was a major objective while working with this age group. Children were made to introduce themselves to the entire class, poetry recitation was done in order to give the students some energy. Books such as Greedy Dog, The Lion and the Mouse, A Visit to the Zoo were used to show the children illustrations of animals. Children identified animals and learnt the sounds they make, where they live etc. 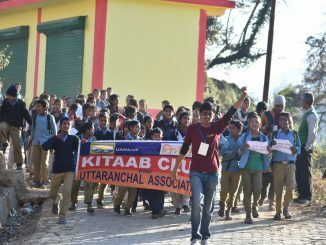 Animated video on hygiene was shown to the students to teach them importance of hygiene. Kit was shown and students were made to wash their hands in school and clean their school. Poems and songs were used to work on the pronunciation of alphabets. It was an effective technique as students enjoyed reciting poems. Primary colours were taught to the students and they were asked to draw pictures from the stories they had read. They were asked to draw pictures on the blackboard as well. Most students drew pictures of animals. The concept of time was not clear and therefore they were taught how to draw clocks. The intern enacted how a clocks hands move. Students were responsive to this activity. Younger children didn’t know the days of the week and therefore were introduced to the concept. Encyclopedias were distributed amongst the students and they were asked to go through them; and select any interesting topic. The intern then explained topics the students had selected by themselves. This was an interesting activity as the class learnt about new and different things as each student had selected something unique. The strength of students in this age group was quite high which led to a lot of distractions in the class. Children were extremely shy in the beginning of the internship. Objective – Increase general awareness and confidence levels of the children. To improve pronunciation of letters and writing skills. Teach concepts of solar system and Indian states. Activities Done – Sessions with globe, map, encyclopedias. Reading stories from “Panchatantra” and then moving on to their course books to make them understand that reading can be enjoyable whether from a story book or course book. Since the students were learning how to identify different states in India, the intern began with a session on the Indian nation and its different states. A map was provided by the school teachers. Students made a list of the states and identified them on the map. Interesting facts about each state were shared so that the students would remember the states and their importance. Students were also given basic information about their surroundings and their own village, district, state etc. 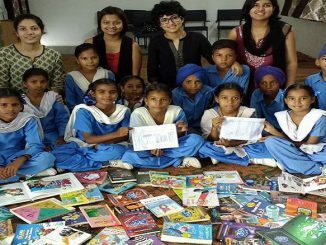 While the main objective was to instill a love of stories in the students, a transition was made from “Panchatantra” to their NCERT books so that students would enjoy reading both. This was helpful in inculcating and developing interest in their academics. A globe, torch, encyclopedias and chart paper was taken to class to explain the concept of day and night, solar system, planets, rotation and revolution of planets, moon, stars and change of weather was explained to the students. Primary as well as other colours were explained to the students using VIBGYOR. This was an interesting activity as students were associating colours with objects they had seen around themselves in the village and the books that were shown to them. On watching the video on hygiene, students were still unaware of diseases such as malaria and dysentery. Through poems the students learnt about the ill effects of not maintaining hygiene. Students were completely unaware of their own surroundings. They didn’t know their district name and region. Complete lack of knowledge with regard to diseases and how they spread therefore resulting in bad habits and zero practice of hygiene. 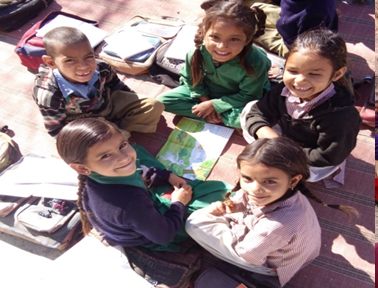 Objective – Instil a love for reading for increased interest in academics, spread awareness about nutrition, basic surroundings and Indian geography. After the video was shown, students were made to make paper bags for waste disposal. They were told the importance of keeping themselves clean. They were taught about bacteria and diseases. They were also taught how to prevent infection. Through stories and poems students were taught about the different food groups and the importance of different nutrients in one diet. They were also taught about the problems deficiency could cause. An interactive game was played to teach children the names of months and days. They were taught about the days in a year and were also taught the concept of time. Students learn the concept of day and night and weather. They were also told interesting facts about each planet. The students of class 5 put together a skit for the younger students to show them how the solar system works. Vocabulary building exercises and regular dictations helped enhance the students writing skills and expanded their vocabulary. Their creativity and imagination were put to test when they were asked to present a skit based on the stories they had read. Logic and comprehension was low. Students didn’t know the names of nutrients or their health benefits. They were unaware about diseases. On 25th December a session on menstrual health and hygiene was conducted for the senior girls. Girls between classes 5th to 10th attended this session. a video by Menstrupedia was shown to the girls which was very informative. Biological reasons behind periods (pituitary gland, hormones etc) were explained to the girls. Nutrients and important hygienic practices for women were shared with the students. Importance of iron for the female body and the need to keep oneself clean during menses was explained. Girls were shy and were laughing at first but slowly got comfortable and began asking questions.